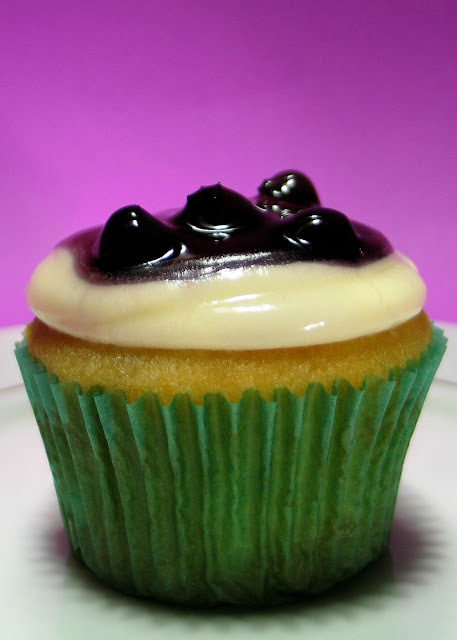 These are vanilla velvet cupcakes frosted with white chocolate cream cheese frosting and garnished with blueberry pie filling or preserves. Rather than your usual angel food cake recipe, the vanilla velvet cupcake recipe here is basically a red velvet cupcake recipe minus the red food color and powdered cocoa. 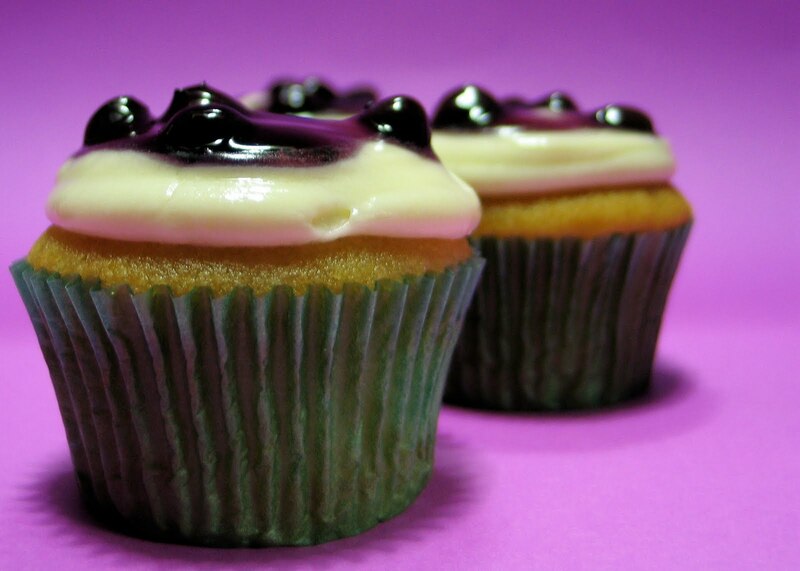 I love the texture of the red velvet cupcake, so I like using the basic recipe every chance I get. 1. Preheat oven to 350°F. Line cupcake pans with paper liners. 2. In a medium bowl, whisk together flour and salt. Set aside. 3. In a large mixing bowl, beat butter on medium speed for 30 seconds. Add sugar and vanilla; beat until combined. One at a time, add eggs; beat on medium speed after each. 4. Alternately add flour mixture and buttermilk to egg mixture; beat on low-medium after each just until combined. Stir together baking soda and vinegar. Add to batter; beat just until combined. 5. Fill cupcake liners two-thirds full. Bake 15 to 17 minutes, or until toothpick inserted near centers comes out clean. Cool pans on wire racks for 10 minutes. Gently remove cupcakes from pans; cool. 1. In a large bowl, beat the butter, cream cheese, and confectioners sugar at low speed until fluffy. 2. Add in melted and cooled white chocolate. 3. Beat on high speed for 3-4 minutes.